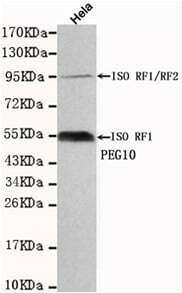 Purified recombinant human PEG10 protein fragments expressed in E Coli. 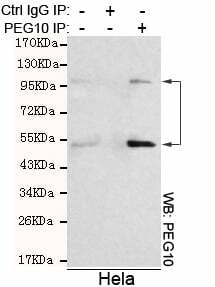 This antibody detects endogenous levels of PEG10 and does not cross-react with related proteins. Contains 1 CCHC-type zinc finger. Interacts with ALK1, SIAH1 and SIAH2. Small volumes of anti-PEG10 antibody vial(s) may occasionally become entrapped in the seal of the product vial during shipment and storage. If necessary, briefly centrifuge the vial on a tabletop centrifuge to dislodge any liquid in the container`s cap. Certain products may require to ship with dry ice and additional dry ice fee may apply. Western blot detection of PEG10 in Hela cell lysates using PEG10 mouse mAb (1:1000 diluted).Predicted band size:55KDa.Observed band size:55KDa, 95KDa. Immunoprecipitation analysis of Hela cell lysates using PEG10 mouse mAb. NCBI/Uniprot data below describe general gene information for PEG10. It may not necessarily be applicable to this product. PEG10: Prevents apoptosis in hepatocellular carcinoma (HCC) cells through interaction with SIAH1, a mediator of apoptosis. May also have a role in cell growth promotion and hepatoma formation. Inhibits the TGF-beta signaling by interacting with the TGF-beta receptor ALK1. When overexpressed, induces the formation of cellular extension, such as filipodia in association with ALK1. Involved at the immediate early stage of adipocyte differentiation. May bind to the 5'-GCCTGTCTTT-3' DNA sequence of the MB1 domain in the myelin basic protein (MBP) promoter. Up-regulated by MYC and dihydrotestosteron (DHT). Interacts with ALK1, SIAH1 and SIAH2. 2 isoforms of the human protein are produced by ribosomal frameshifting. 1. Knockdown of PEG10 expression by siRNA could lead to growth arrest and cell apoptosis in diffuse large B cell lymphoma cells in vitro.